The family that brought you the world’s smallest, the world’s thinnest and lightest, the world’s most manageable, the world’s most powerful AND the world’s first Ready for VR mobile workstations is at it again, this time with faster memory, professional-grade graphics and the latest 8th Gen Intel® Core™ i7+ vPro™ processor and Intel® Xeon® processor that are unsurpassed. With an impressive industrial design and innovative features to boost performance, like the Dell Precision Optimizer and 4K InfinityEdge display, this new series of fully customizable Dell Precision mobile workstations is perfect for both creative collaborations and for running the most demanding professional software. Our high-end 7000 Series are also up to 15 percent smaller in size, so your customers can now handle bulky projects without the bulky hardware. On top of that, each of these workstations is certified with the professional applications your customers need to deliver their best work. 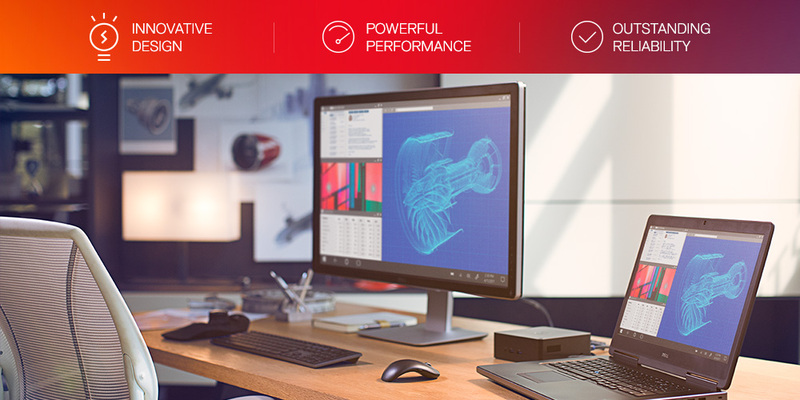 Together with a complete array of accessories, including state-of-the-art docking solutions, it’s easy to see why Dell Precision workstations are the #1 workstations in the world. Dell Precision has many advantages over its competitors – one being Dell Precision Optimizer. Your customers shouldn’t have to waste hours manually setting up their workstations just to get the best possible Independent Software Vendor (ISV) application performance when they can set it up at the touch of a button. The Dell Precision Optimizer will automatically tune their Dell Precision workstation to the software they’re using, delivering performance gains of up to 394 percent2 and allowing them to get on with their mission-critical work. Our top competitor can’t come close to that claim.3 If that’s not enough, the latest version of Dell Precision Optimizer will use machine learning to identify optimization opportunities and apply performance improvements as it runs. You can further help get your customers’ Dell Precision workstations up and running faster than ever before with ProDeploy Plus. With ProDeploy Plus your customers can save up to 35 percent of deployment time4. We load their image on their new Dell Precisions in our factory which accelerates the deployment of software like heavy CAD and design packages. Your customers receive their workstations ready to use straight from the factory. They’ll also receive a single point of contact for project management and service delivery, including up-front deployment planning, configuration, data migration and knowledge transfer. The days of eDocks on our Dell Precisions are a thing of the past. And although this takes some getting used to, the benefits are undeniable. Our Dell Thunderbolt™ Dock allows your customers to connect their Dell Precision to a single data and power source that delivers up to 130W of power for the ultimate display performance. Your customers will enjoy faster data transfers and up to three FHD displays or two 4K displays. Customers can keep their performance topped up with Dell ExpressCharge™ technology, which can charge their Precision battery up to 80 percent capacity in about an hour and to full capacity in 2 hours5. Speaking of displays, the Dell 27” UltraSharp Monitor with Premier Color (UP2716D) is the perfect display for ideal color coverage and incredible clarity on color-critical projects. Your customers can realize their creations in real time and enjoy an exceptional viewing experience made possible by ultrathin bezels, stunning resolution and ultrawide viewing. Whether your end users are designers, video and photo editors, engineers or architects, having access to an interactive workspace that lets them naturally create in the digital world is an incredible advantage. The Dell Precision 5000 or 7000 Series can help break the boundaries of their traditional workspace when it powers the Dell Canvas. The revolutionary “do” surface interacts seamlessly with Dell Precision workstations to encourage hands-on collaboration with 20 points of touch recognition for exact replication of what was imagined. We work closely with our hardware and software partners to bring you Ready for VR solutions optimized for creation and utilization in collaboration with professional ISV applications. The new Dell Precision mobile workstation series is the perfect platform for virtual reality (VR) and augmented reality (AR) content creation and advanced commercial visualization. They’ve been upgraded with the latest 8th Gen Intel® Core™ i7+ vPro™ processor and Intel® Xeon® processor that have more cores and performance for multi-threaded applications that are ideal for professional modeling, analysis and calculations. But don’t take our word for it; try out our Dell Precision virtual reality game to get your sales team engaged with the latest suite of products. We’ve created a set of marketing assets that will help expand your revenue potential by pinpointing your customer communication on the benefits of the new Dell Precision mobile workstations. You can also download the newest Dell Precision Family Brochure now available and tune into the webinar find out how you can transform your customers’ workplace into a hub of productivity. 1 IDC WW Quarterly Workstation Tracker, Q3 2017, November 2017, Statistical tie with HP Inc. Based on Units sold. 2 Based on Dell internal testing, July 2017, using the SPECapc Creo 3.0 Wireframe Graphics benchmark test comparing a Dell Precision 7920 Rack with Dell Precision Optimizer vs. the same system with factory standard settings. Actual performance will vary based on usage, configuration, and manufacturing variability. 3 In comparison to Hewett-Packard’s Performance Advisor (HPPA) UI, which offers no auto tuning. 5 Dell ExpressCharge dramatically reduces time to charge – get up to 80% of your Dell system charged in an hour and fully charged within 2 hours. Based on Dell internal analysis, November 2017.